Since the last Chocolate Roundup turned out to be such a big success, you can rest assured – it will definitely be a regular feature on MyKugelhopf. Considering that my chocolate drawer is always full of a new variety of bars, this shouldn’t be a problem. It changes every few days, as bars get eaten and new ones make a temporary little home in their place. Now that I have admitted to having not only a drawer devoted to chocolate bars, but also a chocolate bar wrapper collection, you’ll understand the frequency of the theme! Last time there were bars from Switzerland, Austria, the United States and even Croatia. If you missed that first roundup, you can check it out here. 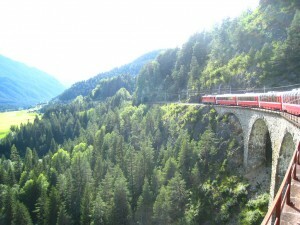 This time Spain and Italy are featured, and I am thinking that there will always be a bar from Switzerland in the mix. As a reminder, I am simply a (very) big fan of dark chocolate, and am always on the lookout for new brands and bars. I loved all the comments from readers last time – chocolates you have tasted recently, all-time favorites, recommendations and other assorted ideas. I’m looking forward to that again. So without further ado, below is the next selection of bars I have tasted lately. Enjoy! 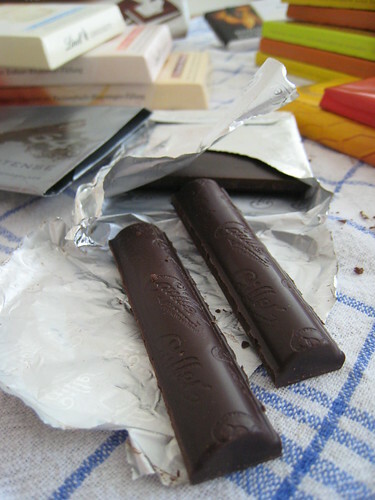 First up is a long-time favorite chocolate of mine: Cailler (which merged with Nestlé in 1929). This is one of my go-to plain dark chocolates, to satisfy a simple desire for high quality and a smooth texture. I love the 64% Crémant Intense, especially for its thin, cylindrical shape (top photos) that’s different from more standard bars. For a sweet treat, I love all dark chocolate with nougatine, crispy caramel fillings, toffee, sugar or salt crystals… I find that added crunch to a rich chocolate bar irresistible. 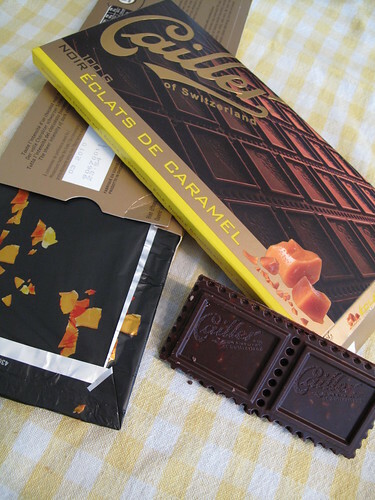 Which might explain why Cailler’s Noir Eclats de Caramel bars are nowhere to be seen in Zürich’s supermarkets anymore – I must have bought them all out. Truth is, they haven’t been on the shelves here for a while now, and I even asked the people at Cailler if this bar was discontinued. No answer. 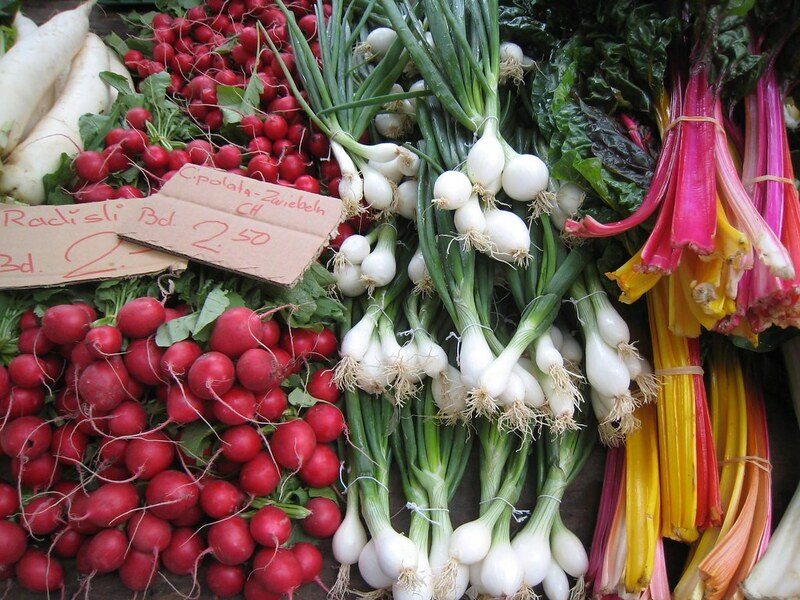 But I was reassured when in a village north of Zürich, there they were. Needless to say, I grabbed more than one! Its black decorative foil inside, squares that cleanly break apart on the dotted lines, good thickness and weight, and a generous amount of nougatine pieces – it’s very addictive, you have been warned! Having seen a fascinating program on France’s TV5 about Spanish chocolate maker Enric Rovira, I was real excited to find a few of his items here in Zürich (Globus, Chocomotion). Besides caramel and salt, the other key word that hits the green light for me is coffee. 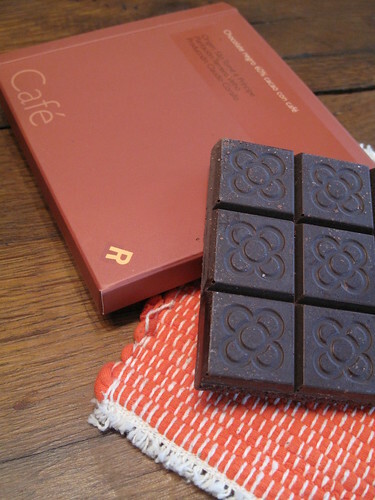 I tried Rovira’s 60% Café bar and loved the look of the 16 square Rajole (meaning tile in Spanish). The design is taken from the stones that were used to pave Barcelona’s sidewalks, apparently now a symbol of the city. 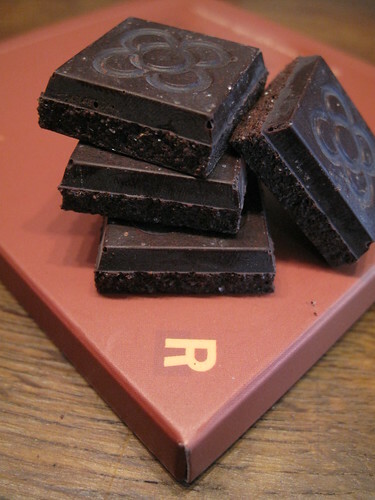 Very thick and coarse, this chocolate is unique – far from sweet and light. The grainy texture is interesting, and if you like your coffee and chocolate a tad bitter, then this is a bar you should try. I’d still love to get to his shop in Barcelona and discover his wide range of creative chocolates. I also hope his website will be translated to English soon, which is only in Spanish for now. 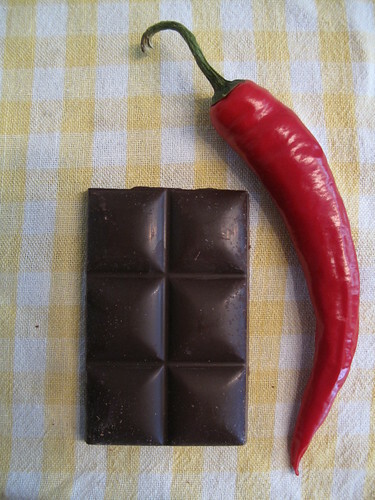 As for keywords that put up a red flag when I’m looking for new chocolate to try, that would be pepper. 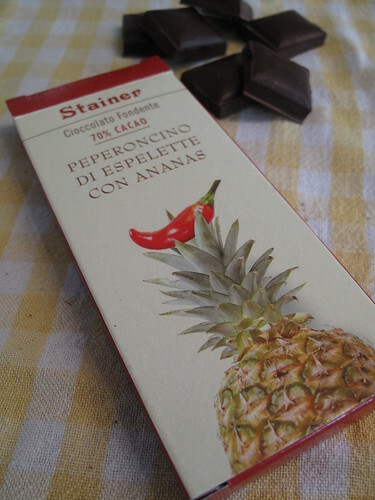 So why did I buy the above bar, Stainer’s Peperoncino di Espelette con Ananas? Well, I had never tried chocolate from Italian Stainer, and I love pineapple. Plus, as the pepper in question was Espelette (of the eponymous village in France’s Basque country, which I adore! ), I thought it would be more flavorful, rather than hot. Wrong. This bar packs quite a good amount of heat, and instead of my usual 2nd square that follows the 1st, what I had was a glass of water. There was a pleasant note of pineapple in the beginning, but it was overwhelmed by the pepper. The chocolate itself had a nice mouth-feel, and so I tried a different bar of theirs with aloe and blackcurrant. Smooth, mellow, faintly fruity, thus allowing me a 2nd (and 3rd) square. Would I buy Stainer chocolate again though… probably not. 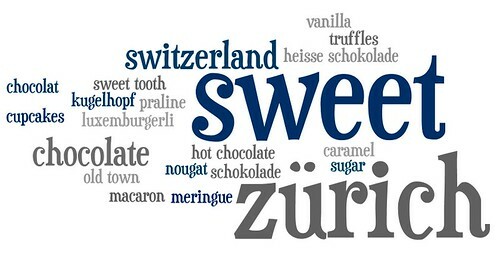 Lastly, to bring the roundup back to where we started – Swiss chocolate. I am a big fan of Villars (from Fribourg in the French region), but just as pepper is a red flag for me, I also prefer my chocolate without alcohol. Yet here I was again, straying from my norm, finding myself with a bar of Kirsch-filled chocolate. 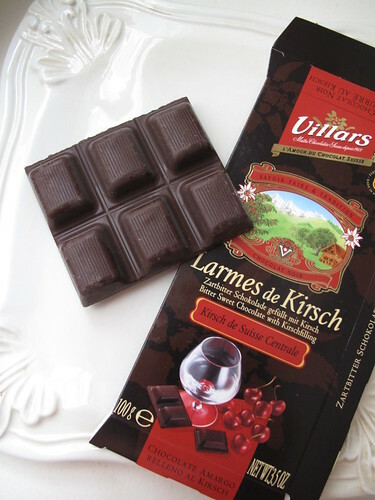 Villars has a whole line of these bars with plump squares, each filled with a different liqueur. 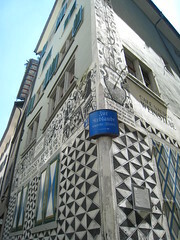 I finally decided to try, and it probably had something to do with the charm of the shop where I found it, in Appenzell. 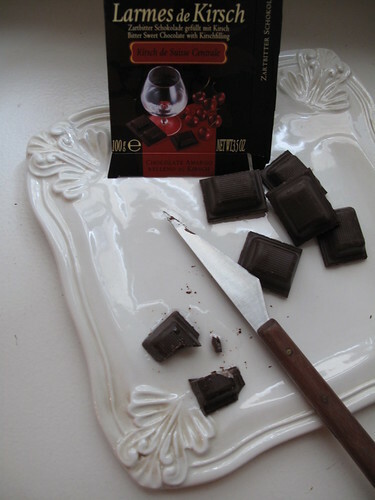 Once I tasted the bar, it was like having a pure shot of Kirsch in each piece. 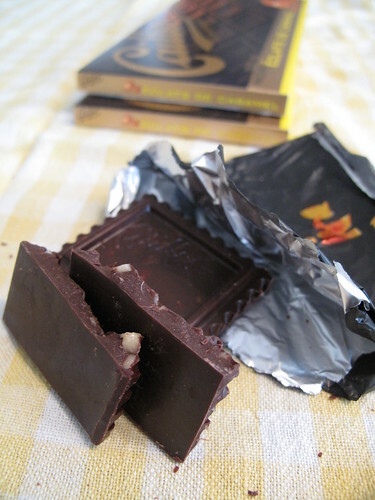 You can have your after-dinner digestif and chocolate in one bite. 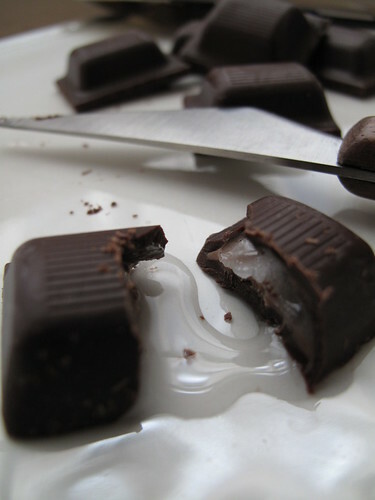 As weird as this may sound, if you cut open the chocolate and let the alcohol ooze out, you’re left with a delicious little bonbon – a more subdued cherry alcohol flavor with crunchy sugar crystals and a creamy, semisweet chocolate background. Quite delicious in fact. I think I’ll stick with Villars’ other bars though. No more larmes for me (tears). So there it is, just a small “taste” of what I’ve been savoring these past few weeks. Please share your sweet discoveries here too – a bar that’s new to you or one that you simply keep going back to since it’s just that good! As for the latter, I’ll always keep going back to Lindt’s Fleur de Sel bar, still my absolute favorite. Soooo much chocolate goodness!! I must try to find these brands, even though I am quite happy with the Theo brand of chocolate bars (and eat it every night, haha). * My absolute favourite, too – oh, and of course it is now specifically Fleur de sel since I’ve been lucky to try! You are really a girl after my own heart. The next time I come to Switzerland, I think i have to take you with me to buy chocolate. Maybe the one with peppers in it would make me skinny because then I would only eat a piece instead of the whole lovely bar. Hello Kerrin. 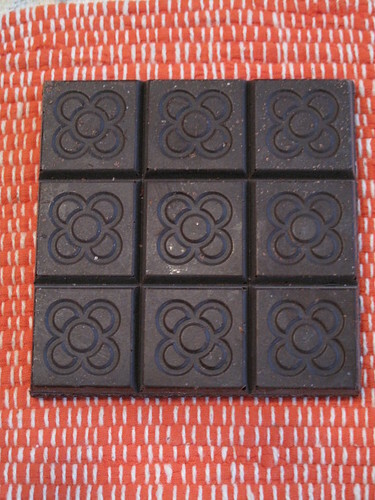 Have you heard of cold-pressed, uncooked dark Belgium chocolate? It has 367% more antioxidants than the Açai berry! No wax or fillers and sweetened with the Açai berry! Would love to get you some samples. We actually need distributors in many countries around the world. Please let me know if you know anyone who might be interested. Thanks! pepper and pineapple, what an expected combination. i do like a little heat with my chocolate once in a while, but it must be very subtle. these round-ups are so fun! sorry, just noticed i meant to write UNexpected combination. sorry about that. VeggieGirl, how lucky are YOU?! Theo chocolate every day? Not bad at all. I wish their chocolates were available on this side of the ocean! 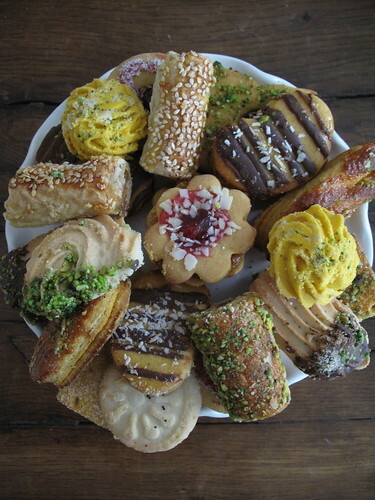 Enjoy a Theo Bread Bar for me, ok? Thanks. Julia, in one year in Zurich, I have only touched upon the vast selection of chocolate here. 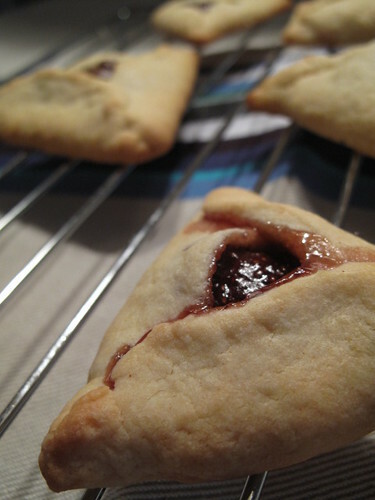 I could do these roundups every month with just Swiss chocolate! 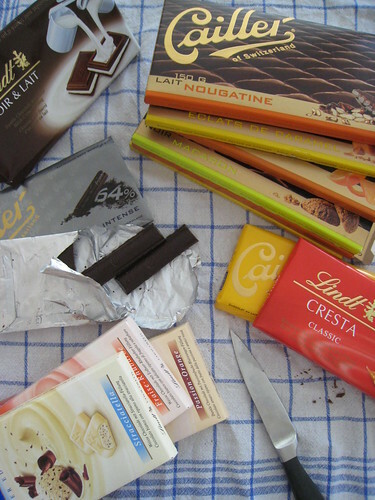 I’m thrilled to hear Lindt’s fleur de sel bar is your favorite too. It’s just that good, right? I would love to know what kinds of chocolate you find and enjoy in your travels around Australia – it’s all about quantity, not quality! kelleyn, you let me know when you’ll be in Zurich, and you’ve got yourself a chocolate date! 🙂 It would be my pleasure. Only… I kind of gravitate to chocolate that makes me want to eat the whole bar!! katy, pepper and pineapple – unexpected for sure, but it works – as long as the pepper is subtle like you said. I am thrilled you enjoy the round-ups! As I mentioned above, oh so many more to come !! 🙂 Mmmmmm! …speaking of which, off for a little morning square right now . . .
Yep, I’m totally inspired to start a chocolate adventure here smack in the middle of the country. You have introduced all of us fans to some samplings this girl has never heard of. All this time I thought I was a choco-snob. Boy, do I have a lot to learn. 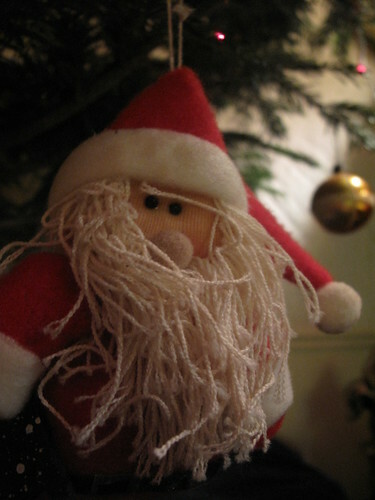 So off I go…. 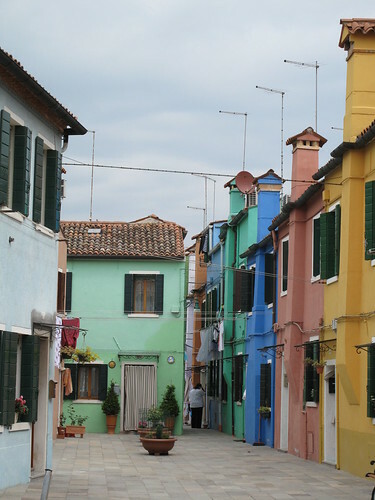 Thank you Kerrin for your wonderful photographs (lots – more the better) and for the education. Mmmm I can smell the chocolate now. Can’t wait. I don’t know if it has ever been available to you but if not you may consider trying Fry’s Chocolate Cream (one of the UK’s few saving graces, on the chocolate front). It is dark chocolate with a mint filling, I do miss them, they are just not available in Belgium. As a little side note, Fry’s was the first company in the world to ever produce solid eating chocolate commercially. 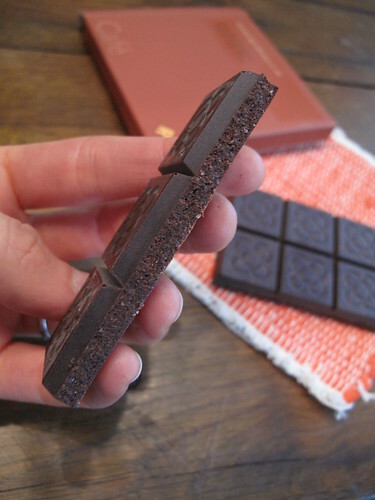 Wow….extraordinary 2nd roundup of chocolate. Thank you for being my taster! I do think that I am exactly on the same page as you when it comes to tasting chocolate. Yes, I would love to put a piece of dark chocolate in my coffee after dinner but to eat chocolate I go with Fleur de Sel. 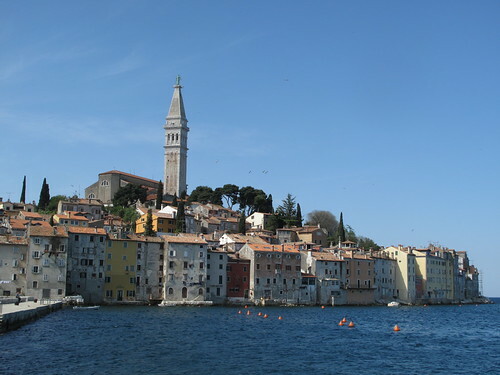 Your photographs are just mouth watering….good enough that I almost can taste the pepper. I can certainly see you run for the water. I don’t like hot types of chocolate so thank you for finding lots of other choices. This post is certainly fun to see what other people like in different parts of the world….thank you once again for sharing. I could start a chocolate drawer here in my kitchen too but it would be empty too fast!!!! AmyRuth, thanks for the fantastic comment! 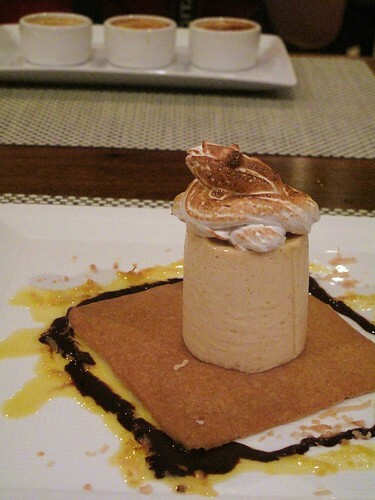 But hey, don’t worry – you may still be a choco-snob, haha! I bet you enjoy a few chocolates that I have never heard of either. Share your favorites with us… pretty please! BBE, mmm, dark chocolate with a mint filling, sounds delicious to me! I love After Eights and Peppermint Patties, so this sounds right up my alley. I just looked it up – it’s one of Cadbury’s chocolates – and wow, just as you said, it was created in 1866! Lani, my pleasure! I will be your taster whenever you need one!! 🙂 And I’ll share my trick about avoiding that empty drawer – – I just keep filling it on a regular basis ! haha! Fry’s was taken over by Cadbury’s some time ago but they used to be an independent company. I found 1828 for the invention of solid chocolate by the Dutch, 1847 for the first commercially available chocolate bars from England and 1875 for the refining of the process by the Swiss, that gave us what we know as chocolate bars now. 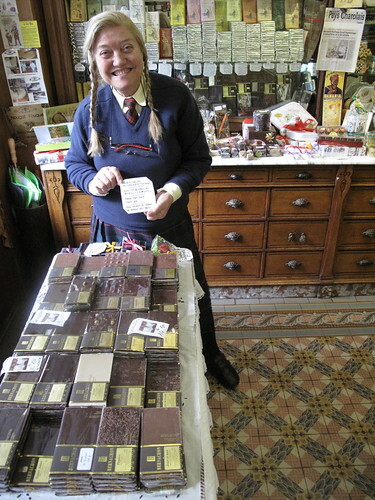 I have dug up a nice info site about the history of chocolate, the address is //www.aphrodite-chocolates.co.uk/history_chocolate.htm It is attached to a commercial site but they have better information than Wikipedia. Oops sorry, I did not know that the web address, that I put in the last comment would show up as a link, I did not mean that to happen. I thought that it would be there as text, for any one who wanted to copy and paste it. I would not deliberately put a commercial link in your comments box. Well, funny you would mention….actually there are a couple of chocolate makers right here in Missouri. Maybe I could send you some. You’ve probably heard of them while traveling in the states. One is Patric Chocolate, and the other is Askinosie I’ve had a few of the Askinosie bars and they are very nice, surprisingly. I haven’t sampled Patric although now that I am embarking upon a new chocolate adventure you can be assured I will be making a purchase real soon. ;~> I am so glad your favorite tennis player didn’t let you down. That is so fun. Enjoy your weekend – ours is a long one here. yippee!! Wow… I just visited your blog for the first time. How come I’ve never heard of you before??? Love it! You combine my absolute favorites — food and travel. I will be back, often. BBE, no worries about the link. I’m all for readers sharing information and great websites for us all to discover. And one about the history of chocolate is more than welcome here. Thanks !! I’ll check it out for sure. 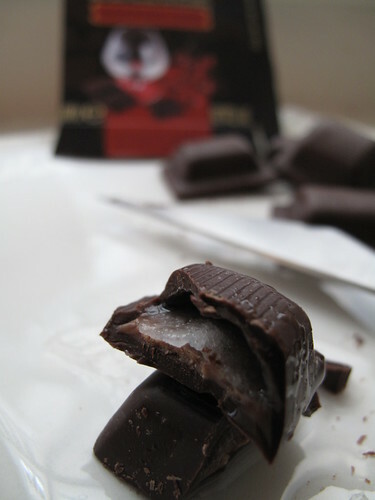 Enjoy your chocolate adventure and don’t hesitate to let us know how your tasting went! Hopefully I’ll be tasting both Patric and Askinosie soon too… Oh, and yes absolutely – Hop Federer ! haha! That first one looks good to me. I’ll be hunting it down for sure. You’re so lucky to have access to all these goodies…nothing like it to be found here…I had Belgian Chocolate a few times and totally fell in love with the stuff. Love black chocolate…but we have not much selection over here in British Columbia…thanks for sharing this visual delight…my stomach juices are now flowing……. The Espelette sounds wonderful – I was so disappointed by the chilli in the Lindt version (much as I adore their Fleur de Sel, they’ve fallen down on this one). Serious serious chocolate envy at the moment! Baron’s Life, no worries on the mix-up. Thanks for checking back and letting us know. 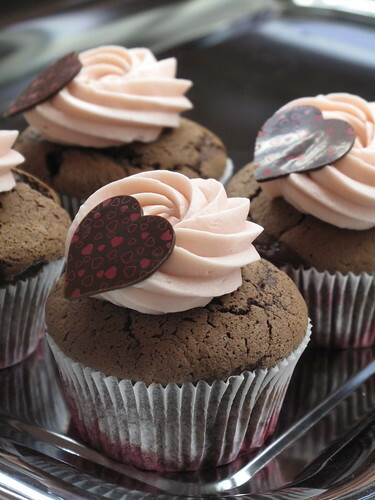 Antioxidants are good – see, chocolate IS healthy !